Our three jaguar cubs received their first hands-on exams last week and, at 3 months old, keepers determined the cubs’ personalities far outweigh their 10-pound frames. The trio—born in March to our jaguar pair, 7-year-old Nayla and 14-year-old father Junior—has been under the watchful eye of jaguar mother Nayla since their birth. 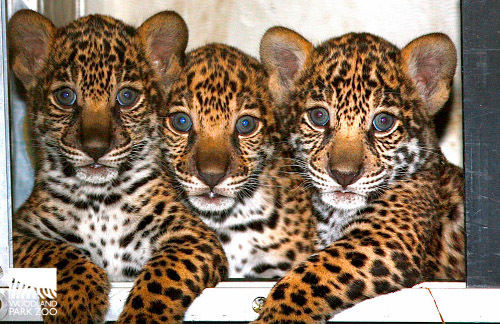 Jaguar births are rare, and as a “near threatened” species on the International Union for Conservation of Nature (IUCN) Red List, the jaguar triplets are a major milestone for Woodland Park Zoo’s jaguar conservation efforts. Health updates were put on hold while first-time mother Nayla demonstrated natural motherly care and protection, so much that keepers couldn’t get hands on the cubs until late last week. Staff learned the healthy triplets include two girls and one boy, all exhibiting curiously different personalities. Jaguar keeper Jamie Delk weighed in on their notable differences, telling us the first born is a girl, and she happens to be the smallest of the cubs. Despite her small stature, she’s the most independent and tends to be the leader of the three. In fact, she was the first to join Nayla to meet the keepers. The male cub—born second—was the largest at the time of birth. Although he is easily distinguished by his vocal outbursts, the youngster is startled easily and is shy around keepers. He’s quite the mama’s boy and is very attached to Nayla. The third born cub is the second female of the litter. She loves to play, but always wants to be near one of her siblings. She regularly follows her older sister and playfully roughhouses with her big brother. Keepers say they’re a tiresome group of cubs, and Nayla would especially agree. One of their favorite toys right now? Nayla’s tail! And with steady growth and development, the keepers are beginning to introduce the cubs to new toys and enrichment items such as boxes, paper towel rolls, and small balls. The triplets really enjoy toys that roll, giving them a chance to playfully swat at them. Nayla and the cubs also have access to an outside yard, in addition to their indoor rooms. The cubs like to run and jump back and forth between their indoor room and outside yard to burn off a little energy. These playful bouts show keepers the cubs’ agility and coordination is strengthening more and more each day. But with bigger adventures and play filling their days come bigger appetites, too. They continue to nurse from mom and receive eight pounds of meat daily, which is twice the amount of meat Nayla eats on her own! 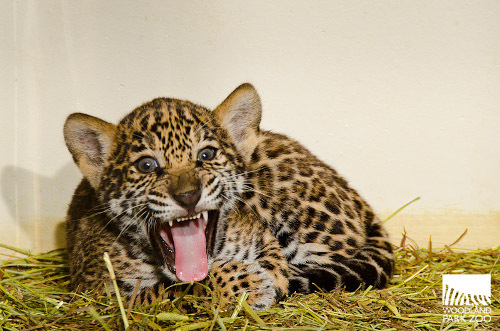 As the young jaguars continue to grow, our staff is working hard to cub-proof their exhibit for their big debut. Our keepers are hoping to see a few additional signs of coordination and growth before introducing them to their exhibit, but we’re confident visitors will meet the trio this summer. Keep in mind, habitat loss and fragmentation of wild areas, hunting by ranchers, and loss of wild prey due to overhunting by humans are major threats facing jaguars in the wild. 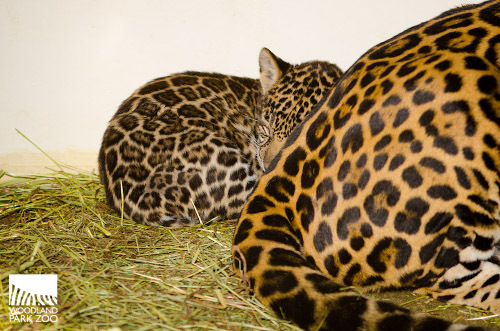 Each year, Woodland Park Zoo’s Jaguar Conservation Fund supports field conservation projects dedicated to preserving wild jaguars and their habitat. The fund has given awards to 19 projects in 12 North, Central and South American countries for a total investment of $113,806. Currently, the zoo supports three projects in Mexico, Costa Rica, and Nicaragua that all aim to find ways for both people and predators to share Earth’s ecosystems. Learn more about our conservation efforts at zoo.org/conservation. A male red-crowned crane chick joined our baby boom May 13 and brought with it hope for the endangered species and its counterparts in the wild. The fluffy, brown chick is finding his way through the wetland exhibit with a little help from his parents, who are no strangers to rearing healthy chicks. The chick’s 21-year-old parents, Niles and Maris, were donated to Woodland Park Zoo in 1992 from Japan’s Kobi Oji Zoo with hopes of bringing more red-crowned cranes into the world. Red-crowned cranes are severely endangered in their native habitat, with an estimated 2,700 cranes remaining in the Amur Basin of Northeast Asia and only 80 cranes in institutions accredited by the Association of Zoos & Aquariums. 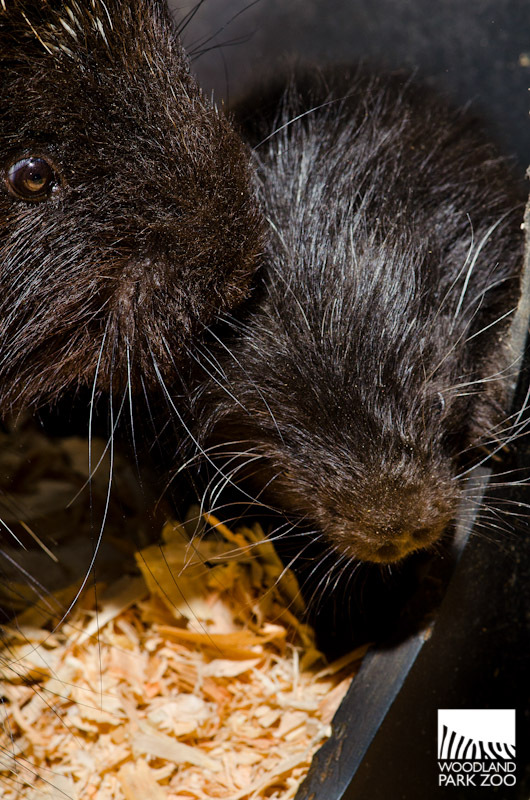 Since the species joined Woodland Park Zoo more than two decades ago, the zoo has celebrated 13 successful hatchings from the pair. The new red-crowned crane chick is on a mission, living as an ambassador for cranes facing habitat loss and life-threatening, human-wildlife conflicts in their Asian range. Woodland Park Zoo is working to bring back the red-crowned crane population in partnership with Muraviovka Park for Sustainable Land Use and the International Crane Foundation, through the zoo’s Partners for Wildlife. In April, the conservation project director for the park, Sergei M.Smirenski, shared an uplifting story of how the park and its community came together to provide food for cranes and storks returning to Muraviovka Park for spring, saving the animals from starvation during the harsh winter conditions lasting far too long into spring. The park, located in the Amur River region, preserves 16,000 acres of wetland and cropland to give cranes—and many other species of water birds—a protected area to breed and stop for feedings during migration. Muraviovka Park is a safe haven for red-crowned cranes and other endangered migratory birds to breed, nest and raise their young. With the help of the community and conservationists, the park is making a considerable difference for the future of crane populations. 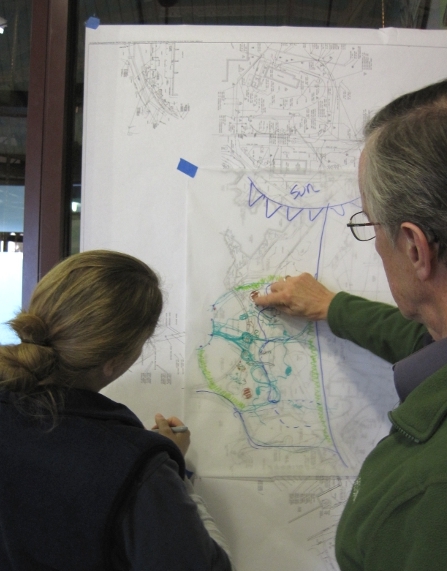 Currently, Woodland Park Zoo and Muraviovka Park staff are joining forces with the local people of the Amur Basin region to identify their needs. In conserving red-crowned cranes and other endangered species, it’s crucial for us to understand the lifestyles of the community members and accommodate their needs just as we do the needs of the animals. The first step to take is to increase public awareness and educate the community about the cranes’ endangerment, and how their actions can allow for a healthy co-existence of migratory water birds and people. You can help, too! Join Woodland Park Zoo and its Partner for Wildlife, Muraviovka Park, to help create a stable population of red-crowned cranes in their native habitat. Learn more about our efforts and how you can get involved at zoo.org/conservation. And don’t forget to visit our new red-crowned crane chick in the Asian Crane exhibit of the Temperate Forest. He’s growing fast! We are getting so excited for our ninth annual Bear Affair: Pacific Northwest Conservation day presented by Brown Bear Car Wash on June 8! At Woodland Park Zoo’s Bear Affair, 700-pound grizzly bear brothers, Keema and Denali, show us why it is important to be bear-safe in the Pacific Northwest. Whether you are hiking and camping in the mountains or simply spending the summer in your own backyard, being bear-safe can help protect you and your family as well as keep our Northwest wildlife safe. Woodland Park Zoo teamed up with local singer Star Anna to create a song about our favorite bear-safety tips. Rock out to the song this summer and remember the rules! Don’t leave those treats out: dog food, bird seed ( in the winter), barbecue scraps, camping dishes and snacks, anything that smells tasty such as toothpaste, deodorant, sunscreen and hairspray can be an attractant for bears. Clean it up! They sniff for garbage: A bear-proof garbage can is the best way to stop midnight snacking at the curb. Use bear cans and ropes: When you camp, practice bear-safe food storage while you are in the back country. Hang your food and other attractants at least 100 yards downwind from your tent. No marshmallows in your sleeping bag: Duh! Keep anything that might smell like food far away from your sleeping gear and tent. No Chanel in the woods: You don't need to wear cologne in the woods, deodorant should be unscented (better for you too) and be mindful of strong fruity-scented shampoos etc. 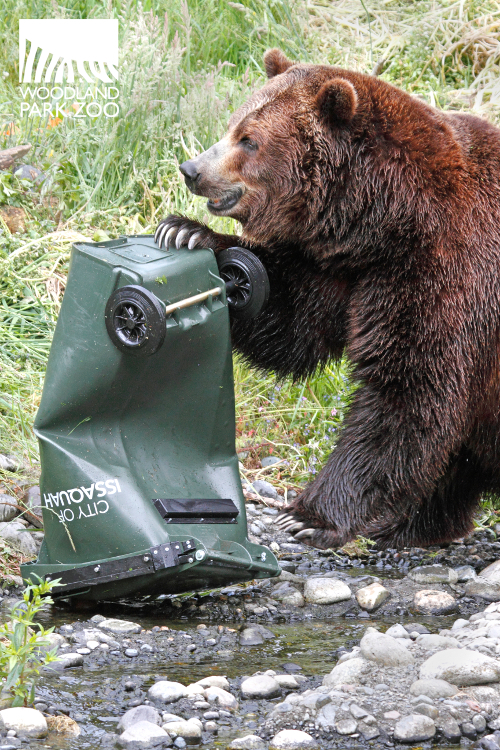 Regular garbage cans don’t stand a chance against grizzlies (or black bears), but a bear-proof garbage can holds its own. The bears are able to smash the cans and dent them, but they don’t get inside! Photo by Dennis Dow/Woodland Park Zoo. By following basic precautions of proper food storage and camp cleanliness, campers can minimize encounters with bears and help protect them in the wild. Similarly, your backyard can be bear-safe by keeping attractants such as a messy barbecue or pet food cleaned up. Definitely not what you want! 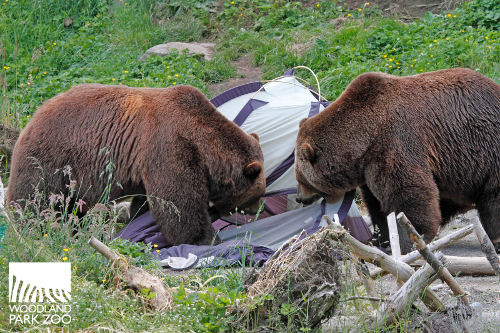 Keema and Denali dwarf a tent during the 2012 Bear Affair mock campsite. Photo by Dennis Dow/Woodland Park Zoo. For more tips on bear-safe camping and bear-safe backyards visit our partners at Western Wildlife Outreach and check out their detailed list Tips for Coexistence with Grizzles. Always be bear aware. If we do our part to keep attractants contained when camping or living in bear country, practice bear safety and give these animals plenty of space, we can help protect not just bears but people too. See you on June 8 for our ninth annual Bear Affair: PacificNorthwest Conservation! Scientist and conservationist Chris Morgan will be joining us at Bear Affair this year! Special thanks to Star Anna for lending us her beautiful vocals for this song (and the zoo's own Elizabeth Bacher for the backup vocals!) and thank you to Joel Casey Jones for his incredible recording skills! 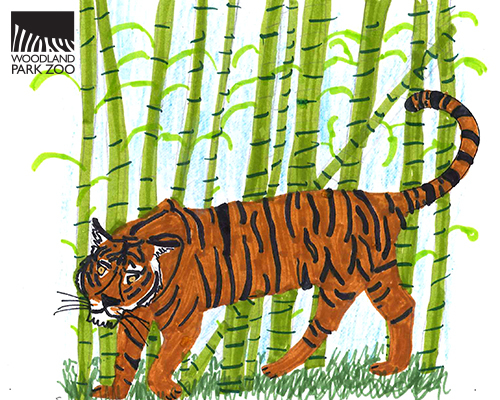 This spring, we asked kids to complete the picture in our Tiger Tails drawing contest to get us pumped for phase two of the Bamboo Forest Reserve. 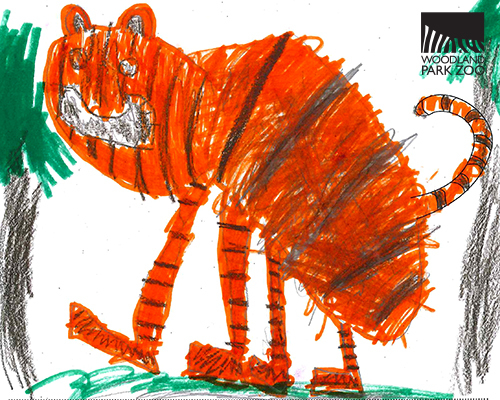 Thanks to all of the amazing young artists who entered the contest through our MyZoo magazine kids section. We received over 130 entries, some from as far away as Germany. 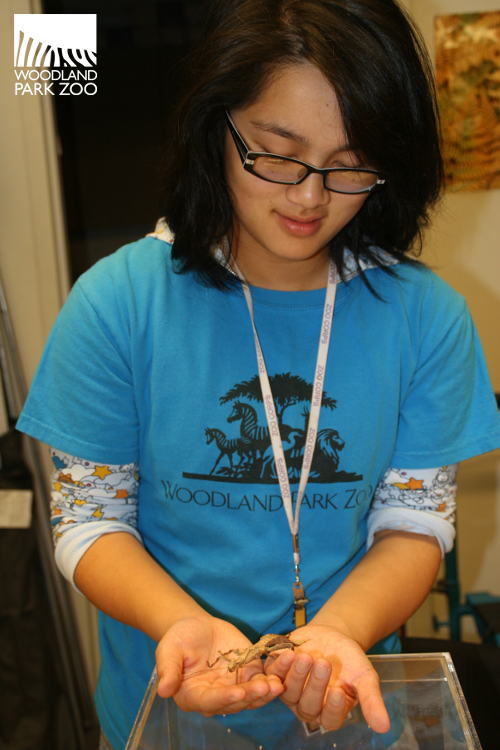 It was a tough decision, but we had a lot of help – 25 staff from across the zoo assisted in judging. We considered detail, use of color, perspective, inspiration and creativity. We were all thrilled with your imagination and talent! Logan and Samantha will both receive a zoo tiger adoption and plush, 4 giraffe feeding tickets and their framed drawing. Mila and Liam will both receive a Woodland Park Zoo t-shirt from our gift shop, 4 giraffe feeding tickets and their framed drawing. Congratulations Logan, Samantha, Mila and Liam! 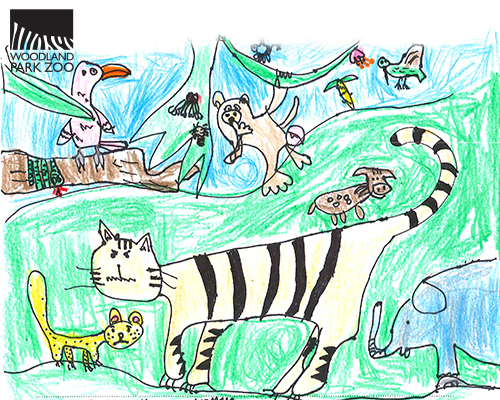 Check out the summer 2013 MyZoo magazine for their awesome artwork! 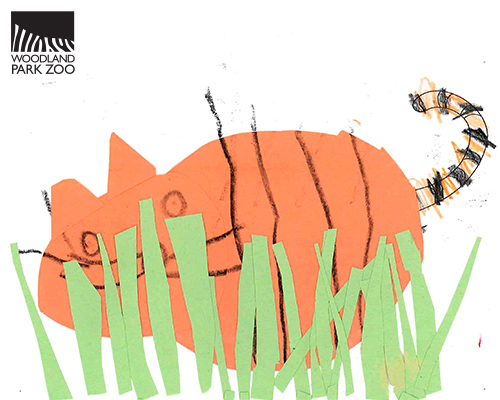 Woodland Park Zoo is all about tiger tails! 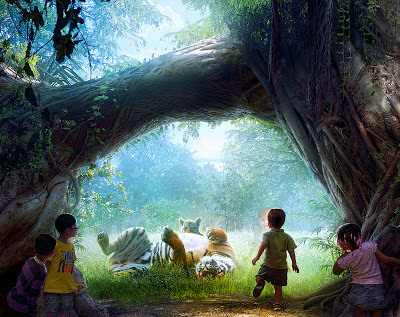 Learn more about tiger conservation and saving their forests. 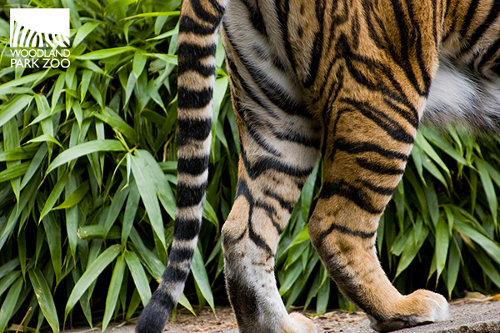 Find out how you can help build a home for tigers at Woodland Park Zoo. Get your paws on our tiger exhibit! To participate in the next MyZoo magazine kids contest, keep an eye out for the fall 2013 issue where we will ask you to put on your writing caps. Want a hint? 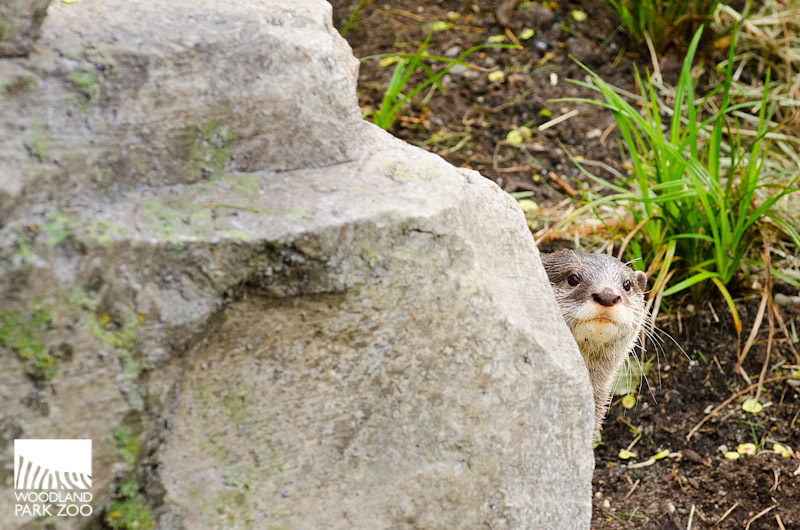 Think northwest animal encounters! Ever wonder how you can do more to help the zoo? Woodland Park Zoo would like to invite you to join our new advocacy program, ZooAction. Every day, issues are being considered at the federal, state and local levels that affect the zoo, our conservation and education programs, and our ongoing effort to save wildlife and their habitats. ZooAction provides a great arena to share policy information as it relates to the zoo and allows you to help advocate for the zoo. By joining ZooAction you are signing up to help advocate for issues that affect the zoo. You can also follow ZooAction on Facebook and Twitter. ZooAction will keep you informed about public policy issues that affect the zoo. You will be asked to take action by contacting your elected officials by phone or email about important issues. 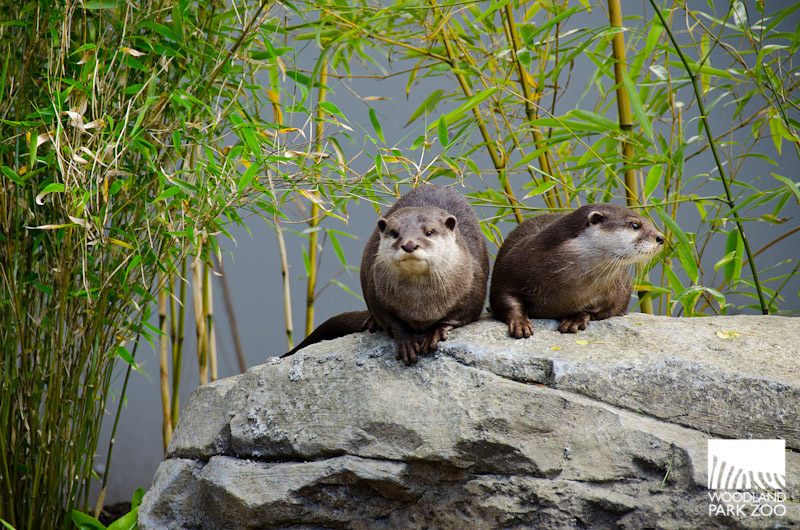 We will also keep you informed about how state or local initiatives or ballot measures impact Woodland Park Zoo, such as the upcoming 2013 King County Parks Levy. This August, the 2013 Levy will be on the ballot to increase funding for King County Parks. Included in this measure is $4.2 million annually (2014-2019) in funding for the zoo. This will help pay for significant zoo programing such as the Community Access Program, environmental education and conservation programs and animal and exhibit care. We will be encouraging people who join ZooAction to vote for the measure and to educate friends and family. Take action and share the zoo’s conservation and education mission with your community leaders and elected officials. 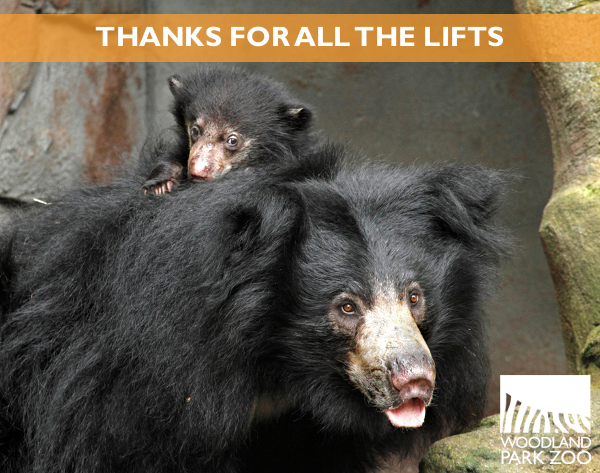 It is the continued support from the community that allows Woodland Park Zoo to thrive and we thank you for your commitment to sustain that tradition. Spread the word, and support the zoo in an active, powerful way! Thank YOU! With the recent baby boom at Woodland Park Zoo, we have posted endless photos and updates on all the fuzzy and feathered new faces that call the zoo home. But with Mother’s Day and Mom & Me presented by Verity Credit Union just around the corner, let’s not forget about the amazing animal moms who are working hard every day to care for these little ones. When you watch lion mom Adia at play with her high energy cubs, you can see just how youthful she herself is—giving as good as she gets with the four little tail biters that never turn down a game of tag. At just 3 years old, it wasn’t long ago that Adia was a cub herself. Adia watching over a playful cub. Photo by Ryan Hawk/Woodland Park Zoo. 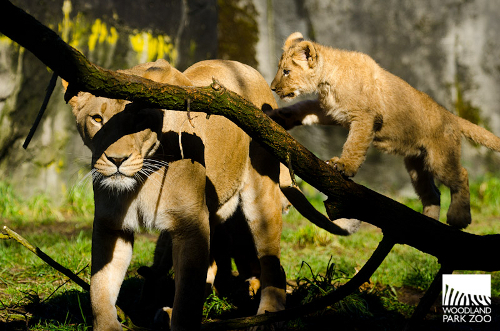 But motherhood has certainly brought out the lioness in young Adia. Caring for four cubs is no easy task for a first-time mom, but her instincts kicked in the moment she gave birth, and she hasn’t missed a beat since. Screen capture from internal keeper cam. 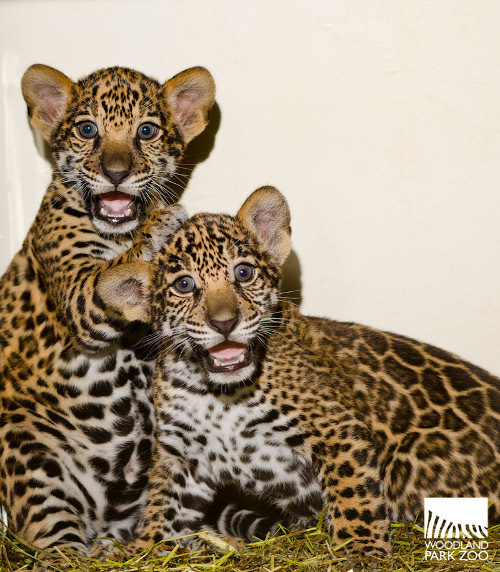 Junior, like all jaguar dads, isn’t involved with his babies’ daily care, which leaves first-time mom Nayla with all the fun of raising her triplet cubs, born in March. All appear to be doing well under her watch in their behind-the-scenes den. 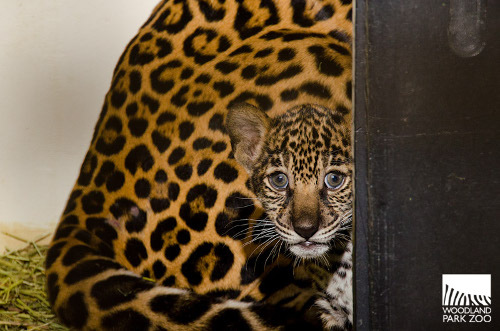 In the wild, a jaguar will give birth in a den and keep her vulnerable, growing cubs there for weeks before emerging as a family. 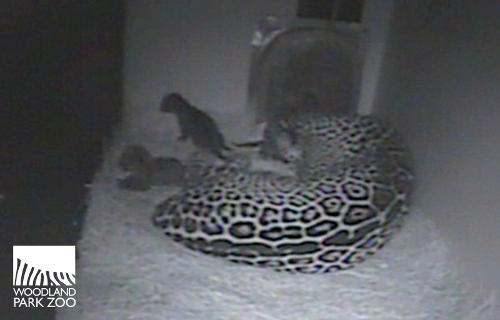 Video: Jaguar cubs exploring their den. Nayla is showing that very same instinct, keeping her cubs tucked away and guarded. It’ll be several more weeks before she is ready to emerge onto the exhibit with her triplets, which will by then all be big enough and coordinated enough to navigate their way around our award-winning Jaguar Cove. 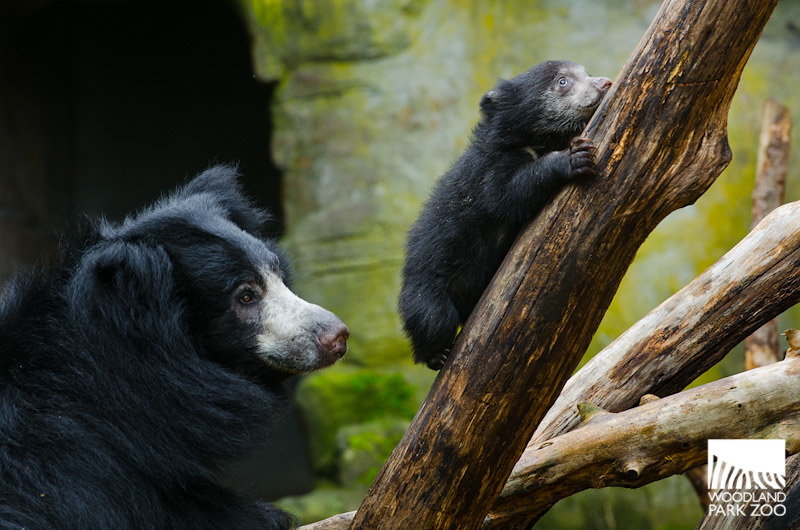 Tasha has proven to be such a protective mom, keeping her babies so closely guarded that we couldn’t even visually confirm we had two sloth bear cubs until weeks after their birth! Now that the young family has made their debut, visitors get to see firsthand how devoted Tasha is to their well-being. Tasha watching one of her little climbers. Photo by Ryan Hawk/Woodland Park Zoo. She keeps an eye on the duo as they climb and explore, and shows them where all the best spots are for snacking, sunning, and lounging around. The babies cling to her back for rides and she carries them ably even as they grow bigger before our eyes. 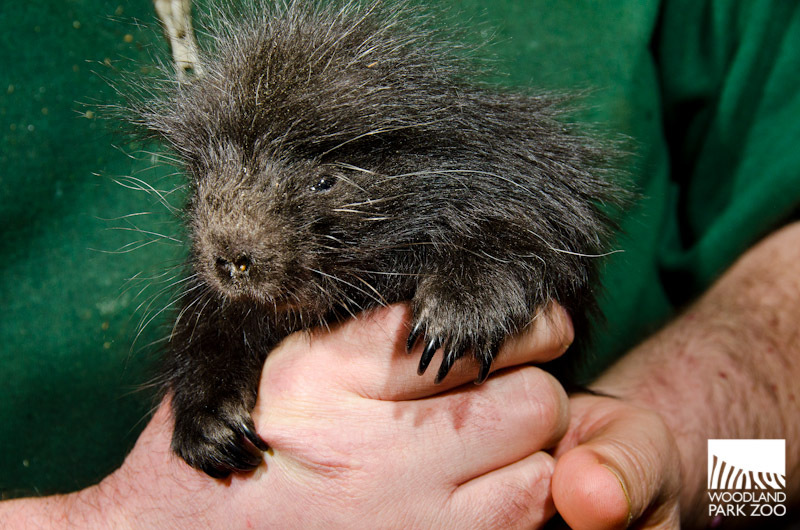 First-time porcupine mom Molly is a master snuggler, cozying up to her porcupette, Gavin, for some bonding. Gavin got a quick checkup and weigh-in from his keepers when his newborn quills were still soft enough to handle. Photo by Ryan Hawk/Woodland Park Zoo. When porcupines give birth, they tuck their young ones hidden away to keep them protected while they go out to explore for food. Molly showed that very same instinct after giving birth, tucking Gavin away in a behind-the-scenes den while she’d venture out onto her Northern Trail exhibit to eat and explore. Gavin has now joined mom out on exhibit and the prickly pair can be spotted on the ground or up in the trees. Once a zoo baby herself, this is Maria at one year old, seen here with keeper Celine Pardo just before an exam. Photo by Ryan Hawk/Woodland Park Zoo. 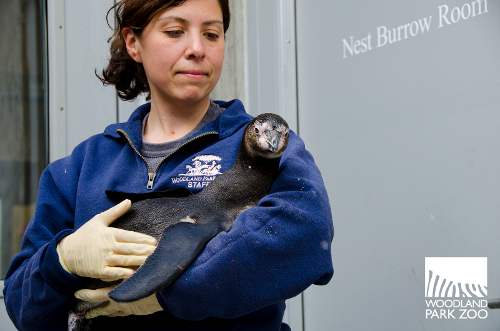 Born at the zoo in 2010—one of the first chicks hatched in the colony after the opening of our new, award-winning penguin exhibit—Humboldt penguin Maria is now a mom herself. Maria’s chick gets a quick inspection from a zookeeper before being returned to its parents behind the scenes. Photo by Ryan Hawk/Woodland Park Zoo. She hatched her first chick on April 27, just two days after her own 3rd birthday, with partner Pizarron. Unlike the other zoo moms spotlighted here, Maria has an active partner in Pizarron, who at 13 years old is an experienced dad. Pizarron is teaching Maria how to tend to the chick and the pair is doing well, keeping it fed and comfortable in their nesting burrow. Maria’s chick is one of 8 hatched this year. 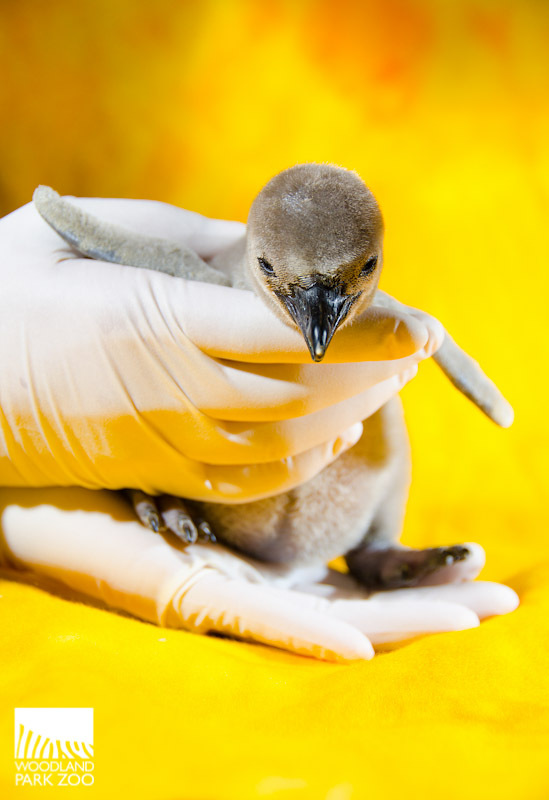 In the next few weeks, the chick will get some swimming lessons from keepers in a behind-the-scenes pool to prepare it for its exhibit debut, coming later this summer. Tree kangaroo Elanna gave birth to a joey the size of a lima bean in June, then carried it in her pouch for months before the little thing finally began to emerge. Elanna pulled double duty as restaurant and shelter for the joey’s long infancy, and even as the baby left her pouch and grew more independent, he was known to duck back inside just for the comfort of mom-and-me time. 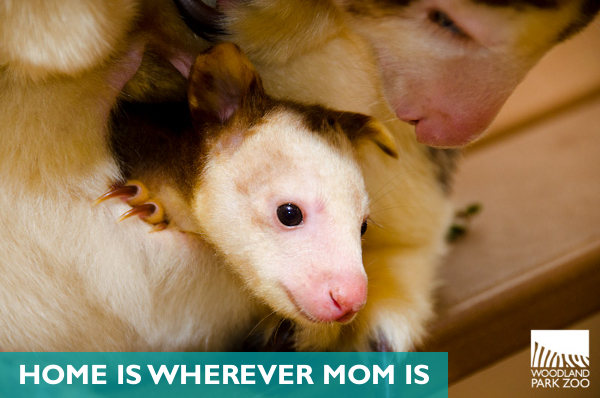 Video: Tree roo joey behind the scenes with mom. Since these endangered animals are so shy and sensitive, Elanna and her joey live in a behind the scenes area of the zoo to give them the quiet they need to thrive together. Zoo fans have watched Elanna and joey for weeks now on our exclusive, behind-the-scenes animal cam, which ended its run this week. With tens of thousands of eyes on mom, we have to say she never disappointed, and boy was she tested by baby’s high energy at times, as you can see in this video! It’s not just the moms of our zoo babies that make Woodland Park Zoo special—it’s the thousands of moms and families who visit the zoo every day and make this place a part of their own family traditions. 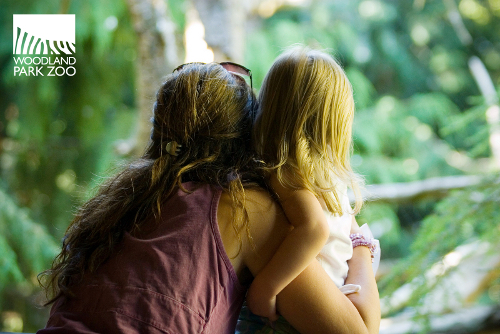 We celebrate all moms this weekend with the 23rd annual Mom & Me presented by Verity Credit Union on May 11. Moms get half off admission at the event, and families of all ages will enjoy special activities throughout the day. Don’t miss our keeper talks focusing on the zoo moms and babies on exhibit now. Get the full schedule at www.zoo.org/momandme2013. See you there! 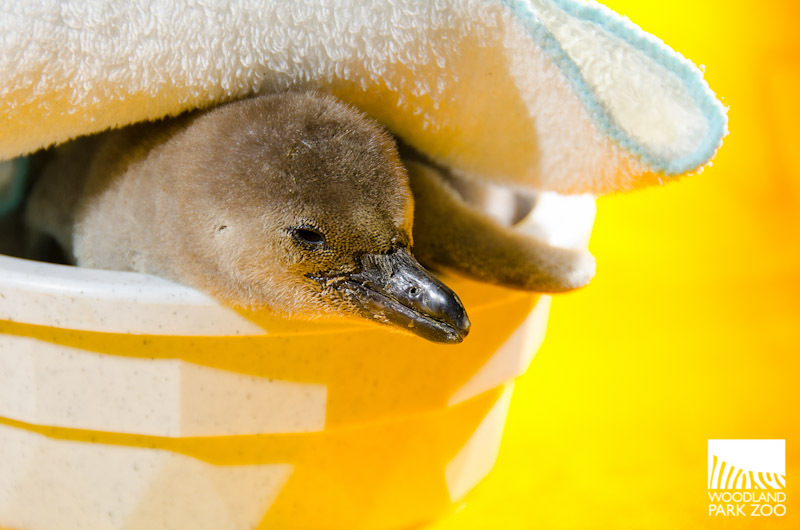 This season brings eight new additions to our endangered Humboldt penguin colony. The chicks will make their debut later this summer once they get a little bigger and become proficient swimmers. 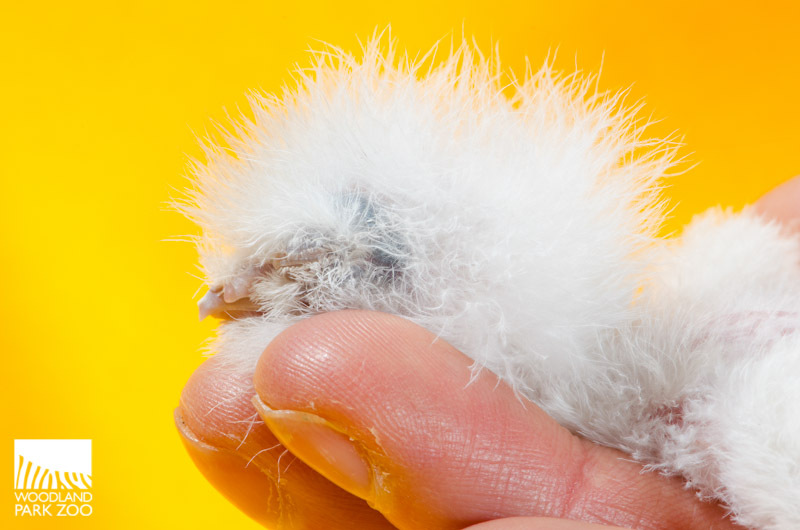 One of the youngest chicks, seen here at 10 days old, hatched on April 27 to 13-year-old father Pizarron and 3-year-old mother Maria, who herself was born at the zoo in 2010. 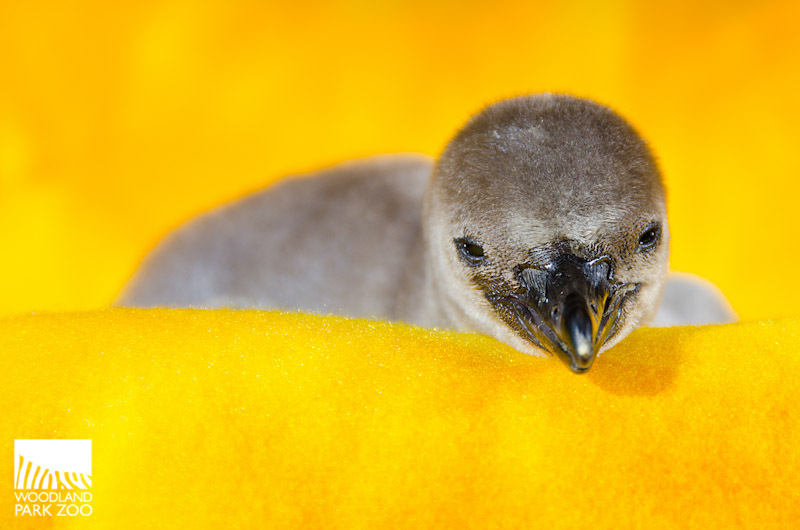 That brings the total number of penguins hatched at the zoo since our award-winning exhibit opened in 2009 to 32! As Humboldt penguins are endangered, these hatchings--part of the Association of Zoos & Aquariums Species Survival Plan (SSP) conservation breeding program--add up to lots to celebrate. SSPs maximize genetic diversity, with the goal of ensuring the long-term survival of populations and the health of individual animals. These new generations of penguins help us continue to tell the story of what is happening to endangered penguins, their ocean habitat, and prey base in the wild. For now, the new hatchlings are off exhibit in nesting burrows under the care of their parents. In these photos, you can see a young chick getting a quick inspection from its keepers before being returned to its parents. Keepers are mostly hands-off, allowing the parents to provide all of the necessary care. 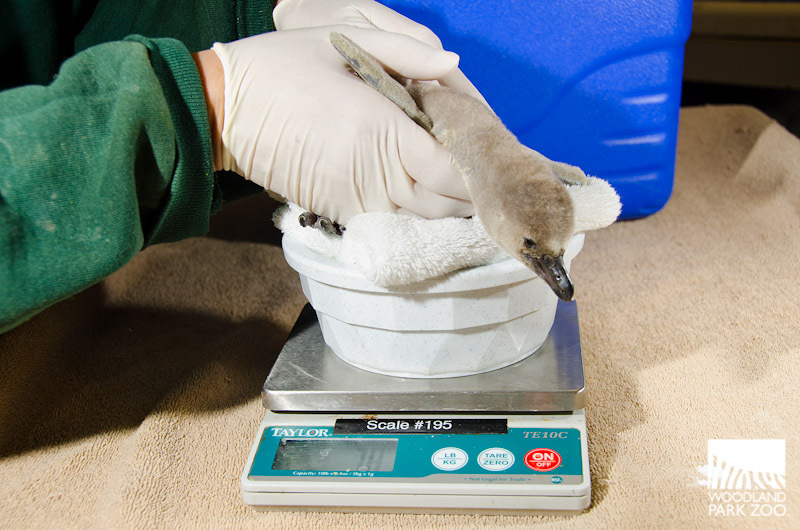 To ensure the penguins are doing well, we do regular, quick weigh-ins to track weight gains. This little one is growing just as expected. This chick was hatched just two days after its mom’s 3rd birthday. Mom Maria and father Pizarron are providing great care for the chick behind the scenes. This is their first offspring together, but Pizarron is an experienced dad and is teaching Maria how to tend to their little one. 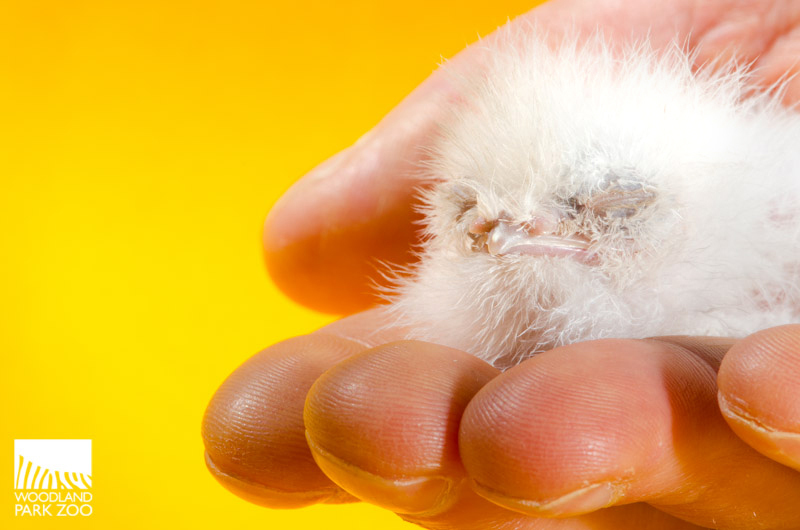 One day old tawny frogmouth chick. Photo by Ryan Hawk/Woodland Park Zoo. The tawny frogmouths didn’t want to be left out of the zoo’s baby boom, so they hatched their first chick of the season last week. Adult frogmouths sport mottled, grayish feathers that let them camouflage themselves like a dead tree branch, but they start life as a little, white puffball, covered in downy feathers. What do you think the tawny frogmouth chick looks most like? At one day old, the chick weighed in at 16.5 g (0.58 ounces). Its parents are doing a good job caring for it in their nest. The chick is weighed daily to make sure its growing as expected, and we’ll offer some supplemental snacks (little bits of mice) if it needs help putting on weight. One day old. Photo by Ryan Hawk/Woodland Park Zoo. The chick’s parents have another fertile egg in their nest, so we may have a second hatching on our hands soon. The family lives behind the scenes together as part of a breeding program for this species. The zoo is also home to a second breeding pair, and we coordinate the Species Survival Plan conservation breeding program for the tawny frogmouth across all accredited zoos. There are only 125 individual tawny frogmouths living in 48 zoos, so we’re proud to have a great track record of success breeding this species and expanding the population. 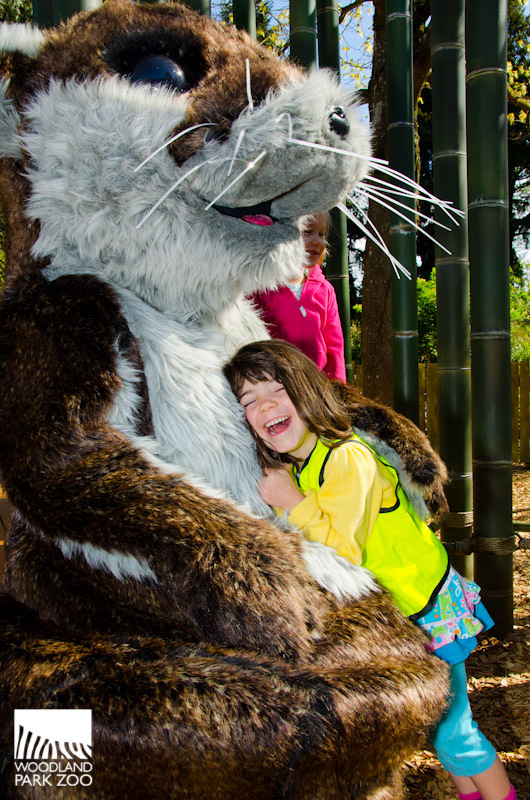 A huggable Asian small-clawed otter mascot greeted children at the ribbon cutting ceremony on Friday and grand opening celebrations on Saturday. Photo by Ryan Hawk/Woodland Park Zoo. Zoo fans of all stripes shared an otterly huge success story last Friday. Hundreds of donors, zoo members, public officials, families and children gathered to celebrate Bamboo Forest Reserve Day, officially declared by members of the Seattle City Council. 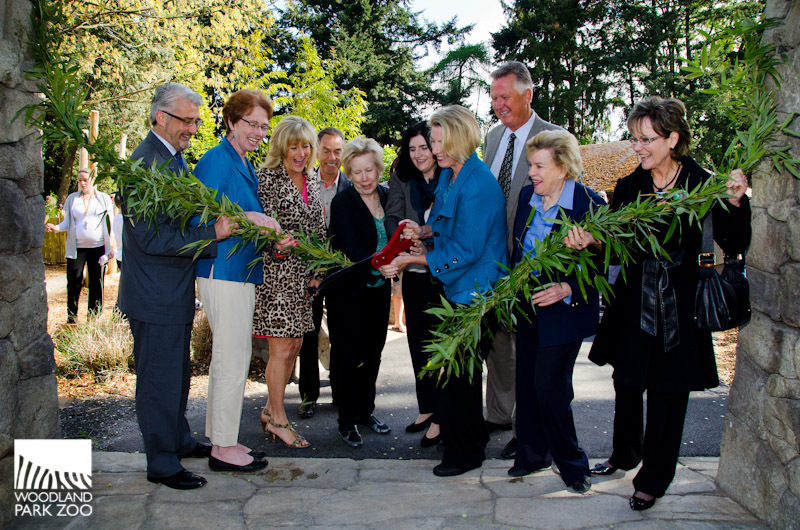 A swift snip of the vine signaled the official opening of our newest exhibit to an eager and deserving community. But what’s really special about this story is you! YOU made it happen. 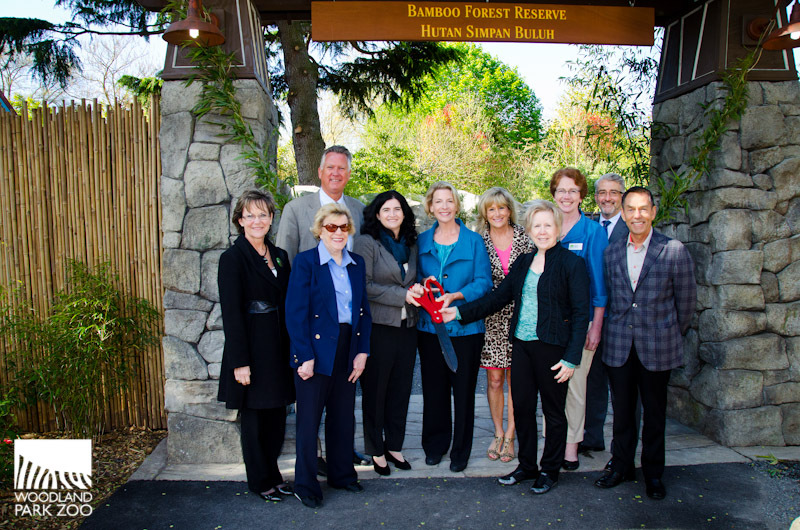 The Bamboo Forest Reserve is a true zoo-community accomplishment, funded entirely by private philanthropy, membership earnings and contributions from the business community, all in the context of a strong public-private partnership with the City of Seattle. So far, more than 1,000 supporters from all walks of life in our community have made gifts to The Asian Tropical Forest campaign initiative, which is transforming old exhibits to new naturalistic wonders in the heart of the zoo. 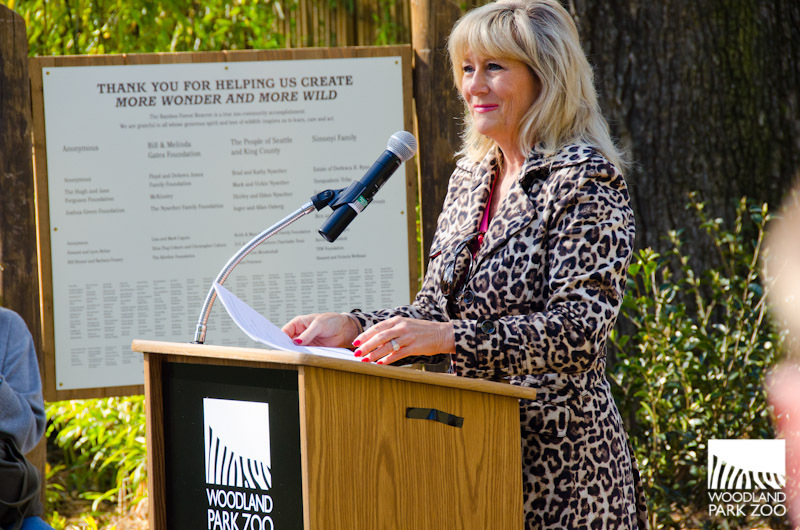 Nancy Pellegrino, WPZ Board Chair, thanks the many generous supporters who helped bring phase one of the Bamboo Forest Reserve to life. Photo by Ryan Hawk/WPZ. Some of our youngest donors, social entrepreneurs in the making, so love Asian small-clawed otters, Malayan tigers and sloth bears that they have sold lemonade or held auctions to raise money to help realize the vision. Others, whose wallets may be just a wee bit bigger, made leadership gifts—investments that really got the project off the ground and inspired countless others to get involved. 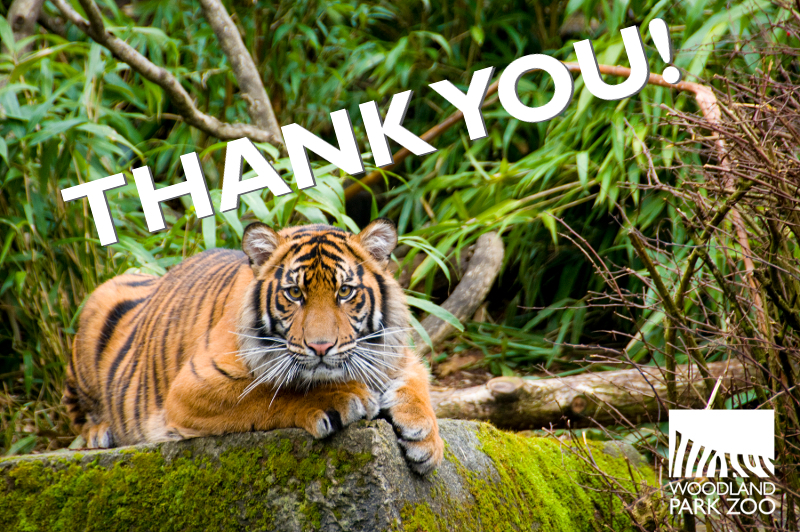 To wit, more than 700 others joined our Give Ten for Tigers campaign last May, which along with a generous gift from the Joshua Green Foundation, helped us raise the final funds for phase one just in the nick of time, allowing us to begin construction on phase one of the Bamboo Forest Reserve. 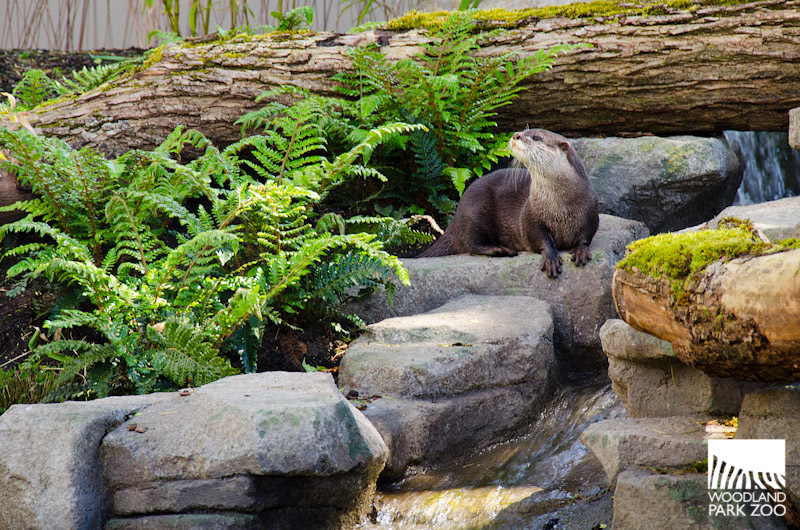 One of our two small-clawed otters takes in the lush view from a rocky perch. 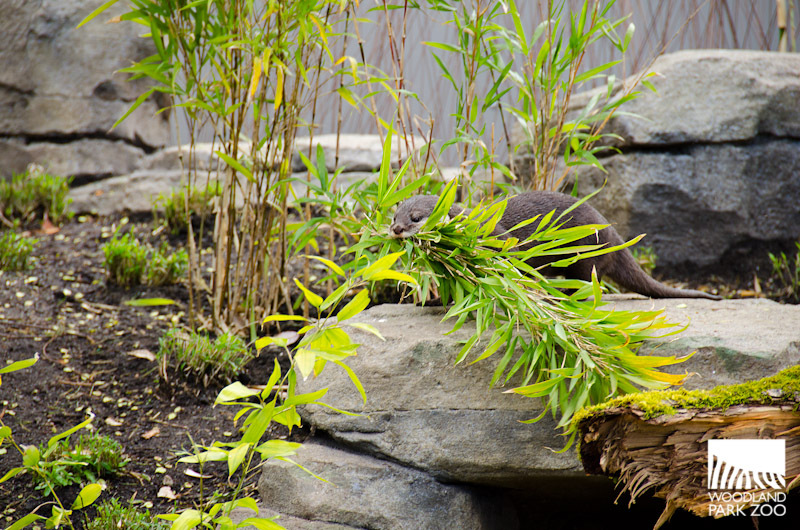 We hope the otter pair will start a family soon. Photo by Ryan Hawk/WPZ. We are also tremendously grateful to our media partner, KING5, for running Evening Magazine stories and television spots which provide sneak peeks to millions of viewers and encourage them to join our campaign. Video: Latest KING5 television spot. Phase one is the first chapter in an amazing new wildlife experience. 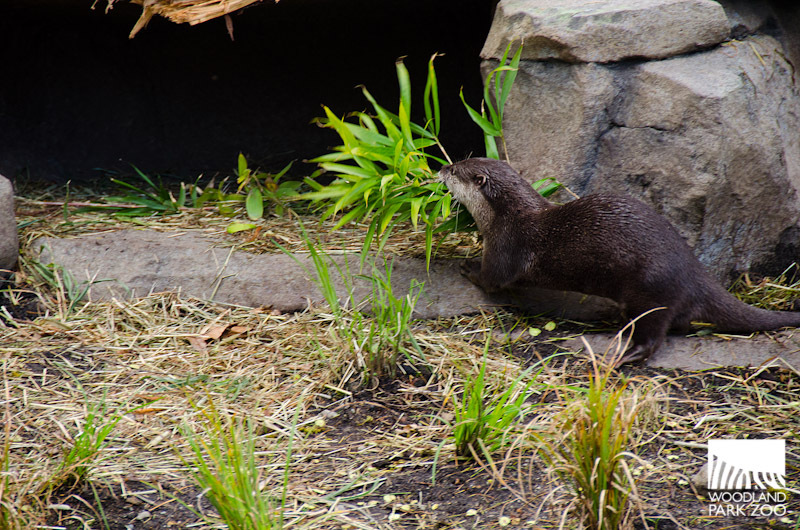 As featured in recent blog posts, it showcases a small-clawed otter exhibit, a colorful and sonorous tropical aviary, and a new nature-play area. Think Zoomazium but outdoors. 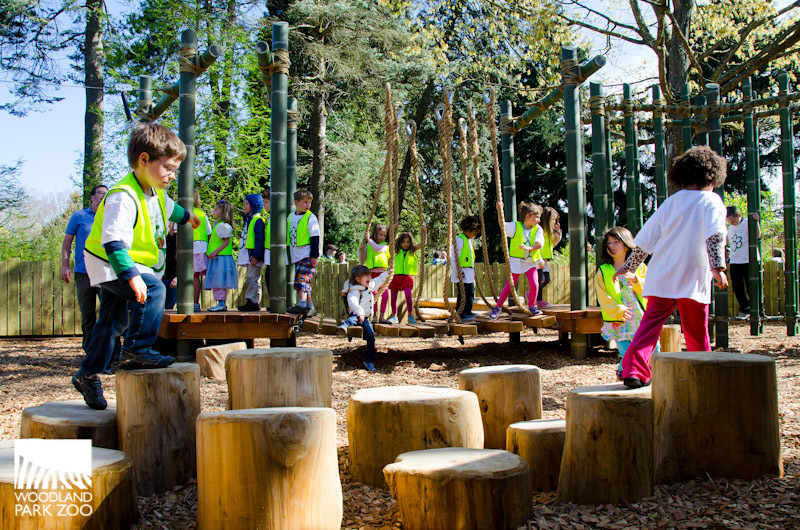 The new nature-play area, next to the otter exhibit and tropical aviary, is specially designed to provide our youngest adventurers fun and whole-body learning experiences. Photo by Ryan Hawk/WPZ. Rounding out the exhibit’s immersion experience are plenty of up-close keeper talks and engaging educational activities, all making the science of forest ecosystems, natural history and species conservation come alive in fun ways. We’re still raising funds for phase two which, when completed, will add new, state-of-the-art naturalistic exhibits for endangered Malayan tigers and sloth bears, and a new Conservation Action Center—the first of its kind at the zoo. When completed, phase two will get you closer-than-ever to sloth bears and endangered Malayan tigers, and will provide you ways to take direct action to save tigers in the wild. Rendering by MIR. Because of you, over its lifetime the entire 2-acre Bamboo Forest Reserve will immerse millions of people in a compelling story about the wonders of tropical Asian forests, inspiring zoo fans all ages to save wildlife and forest ecosystems there as well as to protect our own cherished wonders in the Northwest. 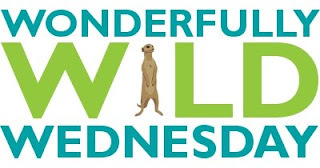 Thank you for creating More Wonder and More Wild! Were you aware that without serious action it is estimated that rhinos will disappear from the wild by 2030? Organized crime syndicates have spread into wildlife crime; bringing technological advancements, networks of smugglers, and high powered weaponry with them. Rhino horn is more valuable than gold in certain markert, and because of this an average of two rhinos are lost every day. 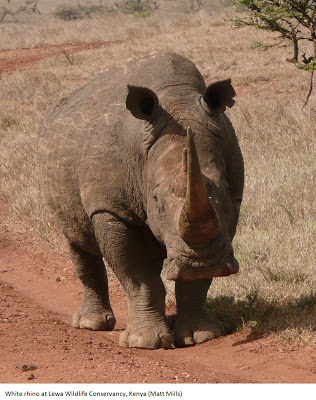 White rhino at Lewa Wildlife Conservancy, Kenya. Photo by Matt Mills. Why is rhino horn so valuable? In parts of the world people have been lead to believe that rhino horn is a cure for everything from the common cold to cancer. Science has disproved this belief. In fact, rhino horn is made of tightly compacted hair. Does that sound like a cure-all to you? It's not too late to stop the disappearance of these magnificent creatures from our planet. There are an estimated 30,000 rhinos still left in the wild, many of which live in conservancies dedicated to their protection. These conservancies protect the rhinos using round the clock surveillance, armed guards, and top notch forensics equipment. Add to this the growing global pressure to stop wildlife crime and it is easy to see how the rhinos have a chance for survival. 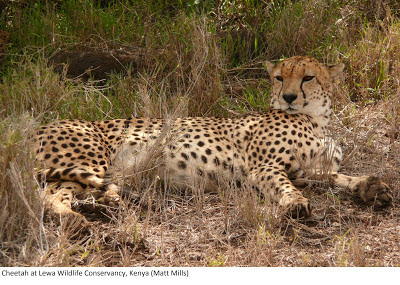 Cheetah at Lewa Wildlife Conservancy, Kenya. 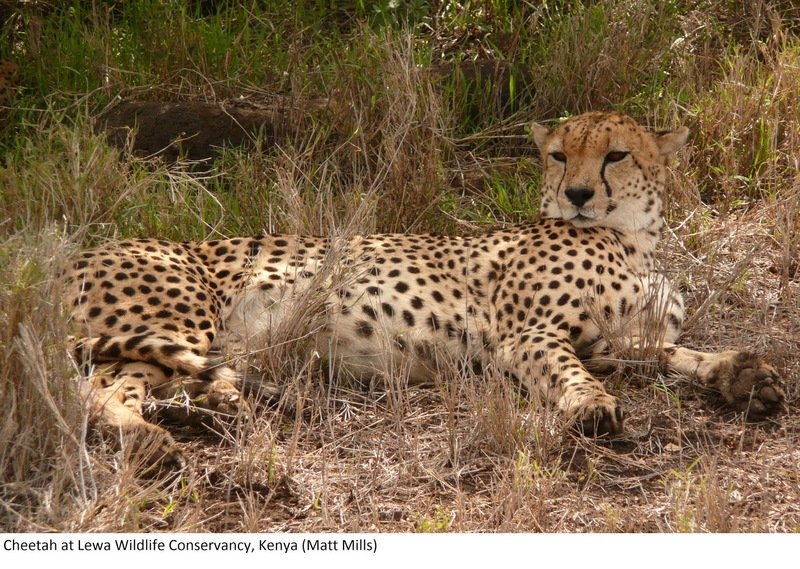 Saving rhinos and their habitat helps to protect other magnificent animals, including cheetahs. Photo by Matt Mills. 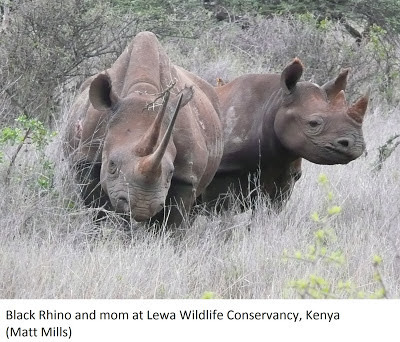 How can you help protect rhinos? Join Puget Sound zoo keepers at Bowling for Rhinos on Saturday May 18th at Lynnwood Bowl & Skate and help “Strike Out” their extinction! Bowling for Rhinos is a nationwide event sponsored by American Association of Zoo Keepers (AAZK) chapters. 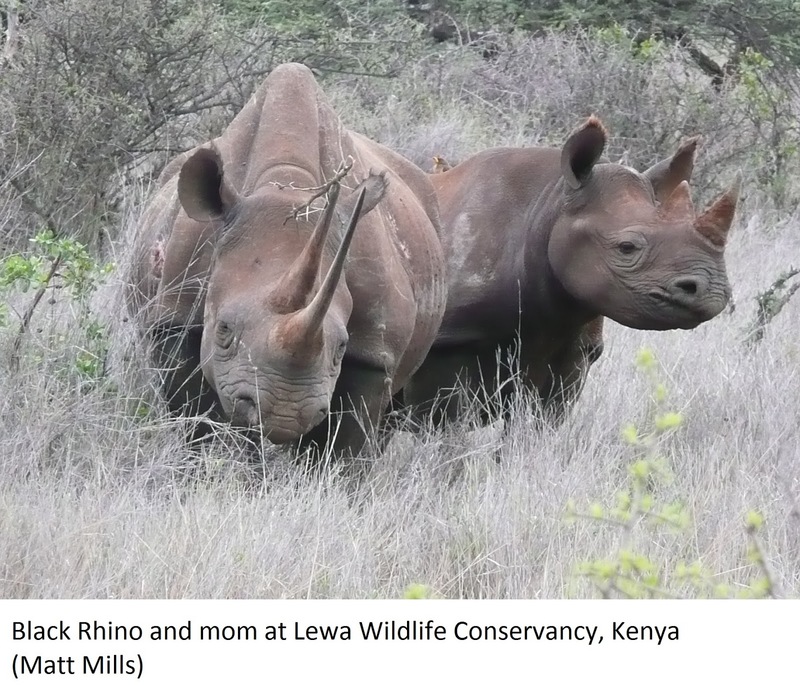 Since 1991 Bowling for Rhinos has raised over $4.3 million, 100% of which has gone directly to saving vulnerable rhino species and their habitat in Kenya and Indonesia. By protecting rhino habitat we protect everything in their habitat, including tigers, orchids, zebras, orangutans, tapirs, cheetahs and elephants. You can learn more about Bowling for Rhinos at AAZK's webpage. Check in starts at 5:15 p.m., bowling from 6:00-9:00 p.m.
Bowl - $25 for three hours of bowling, shoe rental, taxes, and pizza. Party - $15 to enjoy the party. Includes pizza, trivia, games, and a raffle. We've worked very hard with local businesses to gather great prizes for the top fundraisers and for our raffle. Check the Bowling for Rhinos Seattle Facebook page for details.